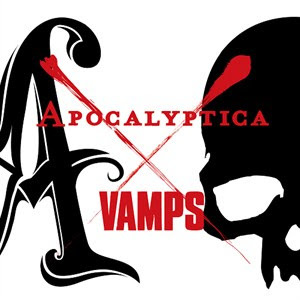 VAMPS x Apocalyptica Collaborative Single "SIN IN JUSTICE" Release | VKH Press – J-Rock & Visual Kei Coverage Worldwide! VAMPS fans, you are in for a real treat. The Japanese rock band will be collaborating with the Finnish heavy cellists, Apocalyptica, to release an exclusive single together just in time for their coupling tour in the United Kingdom later this month. The new single is called SIN IN JUSTICE and it will be on sale November 20 via Spinefarm Records, the same record label that helped release VAMPS's BLOODSUCKERS internationally earlier this year. The single has been in talks since both bands have toured previously together early this year in the United States. Both expressed the desire to work more together after having a successful tour, and thus, the single came to be.